screenshot of battle results. Please note I played badly, and only got round to launching one strike action against a BB (a measly weakling of a Grosser Kurfürst). the rest of the time I only scouted and spotted dds (normally the number 1 job of a tier 8 CV in a tier 10 battle). Initial impression, the 3 x DWT tbs are, like the 3 x rng point click to drop AP/HE diver bombers, overpowered and ridiculously easy to deploy. I noted also in this test version, I had fewer replacement fighters, so could not afford ANY fighter v fighter duels, or even strafing. They were viable only as pure scouts. But I had a silly number of replacement torpedo bombers. Is it overpowered? Of course it is. Stupidly overpowered. 94 000 dmg from one strike, on one target, with automatic targeting (point/click and drop). A fair amount of tier 7 fighters, a fair amount of what should be tier 7 bombers, ONE (1) TB group at most with 2 HE DB groups, or just 3 HE DB groups decent for taking out DD's but take a while for fires to burn down a BB. That is all this bloody needs aside from likely the tier 9 upgrade because Wargaming's failure at balancing AA properly thanks to manual drops. Not to mention 3 TB's was OP as hell BEFORE they released the ship with DB's only, what would even posses them to think the same thing, with deep water torps, would be any different? The ship was basically built as a commerce raider, likely running more into DD's, maybe cruisers. It has one of if not the most notorious DB's of the war, dated as it may be. And other than maybe Kaga, and to an extent Saipan, we have no real decent DD hunting CV's unless they dial in USN DB accuracy. We don't need another BB nuke-er. Why when manual drops are still a thing can we not just have a CV balanced properly that the accuracy of it's DB's is good for picking on a DD, but unless you aim manual drop well can really only start a fire or two due to it's accuracy and the bombs really only hitting in one area? Why do we need to keep going and trying for insane gimmicks that make everything worse? This is why iChase and the like snapped the way they did. Is wargaming just understaffed or lost a bunch of people on CV balance? No one left to crunch the numbers that some ships can reach 100%+ chance per second to shoot down aircraft, that the same chance per second applies to fighters and that USN's is too high to be balanced, that changes like this won't work? Seriously Wargaming, I got time between games I work and I'll consult for cheap, just gimme a GZ when were done, maybe some premium time. but this us getting ridiculous. K.I.S.S - Keep it simple, I suppose I'll go with silly to avoid offending anyone. @Doomlock, present in the same battle, can testify..
Well I've played two battles. Both of them defeats thanks to teams who wouldn't cap. 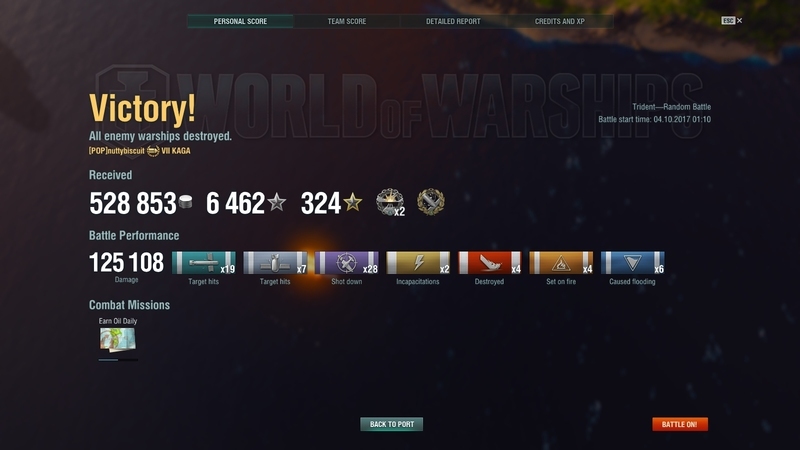 Both cleared 100k damage, my first had too many destroyers for me to do much. The second was a more balanced game and I could have broken 200k if I would have had a bit more time. All in all this is the second worst iteration of this ship, only to when its torpedoes could hit destroyers. I still think that deep water torpedoes are a dumb idea, but at least I get to enjoy the battleship salt while I test. Also just to clarify, just because you can do an obscene amount of damage doesn't mean it's a good carrier with the slow bombers and no real way of helping the team deal with DDs in a lasting way I'm going to chalk this test version up to a BB to Salt converter and that's about it. I agree. This build is great against BB, but you are useless against DD. If you wind up in a Tier X match with 3+ DD you might as well go hide in a corner and just spot. If we truly cant get AP/HE switchout for DB then perhaps a 2-1-3 build would be about right keeping the small circle for HE DB? That allows maximum versatility, without being OP against any one class, and a unique CV. I don't know about a 2-1-3 from a aircraft in the air standpoint. Assuming squad sizes maxed out at 5-5-6 that's 10 fighters 5 torpedo bombers and 18 dive bombers for 33 aircraft in the sky at one time. With a hanger of 72 I think that's just too much in the air for the ship. 2-1-2 would be more reasonable with a total aircraft of 27. Even if it isn't the most original load out. Although I would like to see maybe a 2-0-4 where you can get two AP and two HE bombers if they had the same 120 m circular drop that would be an interesting strike package, but that would be even worse off from the total aircraft in the air perspective.Would be different though. But truthfully the released HE bombers in the 2-0-3 is honestly a solid carrier, I'd say drop both the dives and fighters to tier 7 to represent the air-frame's age and maybe give the Stuka's a slight health increase to help cut down on bomber losses when in tier 10 games, if we got the AP bombs from the test 1 (I am renaming the deep water torpedoes to test 3 for clarity sake) as a full switch option I wouldn't be disappointed in the ship. Some people would be but I don't know, I like this ship. I've always liked this ship. The old AP bombs were too hard to use, but if you got into them they were devastating, the first round of testing gave us the Test 1 bombs that I think should have been the original bombers. The only thing I would like to see added to the GZ other than the AP bomb switch over would be the 5 second launch time for the fighters and the tier demotion. A health increase for the bombers would be nice but honestly I don't have too many problems with them. Lastly I still would like to see something done to give the Graf Zeppelin a closer to front line role even if it is only when it is top tier. Cause currently it's just a carrier with good self defense secondaries. I'd like to see the role of aviation cruiser explored where we get an average or even below average air group but 10 - 12 km secondaries with solid accuracy at that range to let us easily chase down destroyers that want to kill us, give cruisers a run for their money in a one on one duel and make battleships think twice about getting in close.
. 2-1-2 would be more reasonable with a total aircraft of 27. Even if it isn't the most original load out. Although I would like to see maybe a 2-0-4 where you can get two AP and two HE bombers if they had the same 120 m circular drop that would be an interesting strike package, but that would be even worse off from the total aircraft in the air perspective.Would be different though. I would be a huge fan of that loadout. I love the small circle HE bombs for DD hunting. The AP small circle would be enough to cause damage to BB but not obliterate them. Fighter Tier VII and your done. Thanks for the solid posts. I'm going to add my experience here as a recipient of GZ damage on three different occasions while running a North Carolina fully spec'd with AA upgrades and related commander skills. In all three battles I was one-shot at either full health or close to it. After experiencing this the first time I was wary and tried to be much more defensive / evasive. Didn't matter - same result. In one of the three cases I shot down one enemy plane, in one instance zero, and in the third instance five. I think the comment above sums up the Graf Zeppelin, "I agree. This build is great against BB, but useless against DD." To be fair, I didn't receive any defensive air cover in any of these cases (which does make a huge difference). What I couldn't get over was the sheer amount of torpedo's in the water. I'd rather face a Shimakaze 1:1. The play testing does appear to simulate what really happened between air power and battleships. BBs became obsolete except when one has air superiority (what happened to HMS Repulse and HMS Prince of Wales in WWII signaled the end of dominance for BBs). So if that's the goal then I would say the designers have achieved it. However if play balance in a game is to be considered, my experience to this point is to discourage play of BBs at the upper tiers. Understood that three matches is a small sampling and perhaps the more cynical among our players would say things like, "well maybe you are just a bad commander or had three bad games." I suppose that's possible. The experience leaves me questioning the play balance. Am close to being able to upgrade to an Iowa but would have to spend real world money for the credits to buy it. The question becomes, why do I need another vulnerable upper tier BB? Seems better to focus on CAs, DDs, and CVs. I'm going to add my experience here as a recipient of GZ damage on three different occasions while running a North Carolina fully spec'd with AA upgrades and related commander skills. Views such as your own (on the recieving end) have been too rare in the GZ debate so far, so you are very much welcome! With an Iowa and later Montana, I think you will be immune to GZ attacks (mostly), your AA makes you pretty much invulnerable, if not dangerous to our dive bombers. I for one avoid Iowas and Montanas, and systematically hunt IJN and KM battleships, far easier to attack for far fewer losses/ Unlike our warship classes, CVs have limited ammunition (the number of planes they carry), an Iowa is not worth our time. Why not have a 2/2(AP bombs)/1(HE) or 2/1(AP)/2(HE)? I truly don't understand why we can't have a mix squadron of dive bombers. The AP dives from GZ1 even with a mild delay were potent, and in my opinion, better for the health of the game then partially OP TBS that can't damage a particular ship class. The Pan Ans' will at least have guns to deal with enemy dds. Not if you leave literally every stat the same except for the tier. Cause let's face it currently the fighters and bombers on the 'released' Graf are tier 7 in the HP department. As for the current test 3 the fighters are the same except they are tier 7 and the Stukas have more hitpoints so they are passable as tier 8 aircraft, so I wouldn't fault them there. Also AA DPS isn't tier dependent. It is fixed to the ship so you could say they are tier 27 aircraft but if the HP is the same as a tier 7 aircraft they will die like tier 7 aircraft. 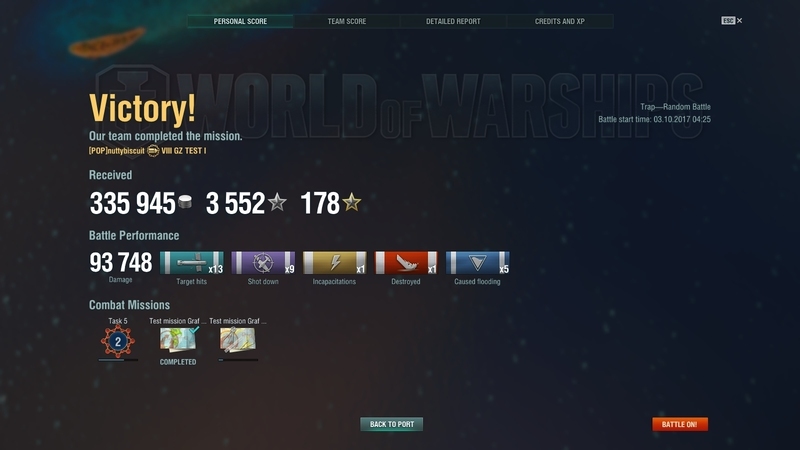 But this has not happened, stats in the TEST version have been lowered along with the tier, from tier 8 to 7. Which is why I am adamantly opposed to the tier drop (bad pun day, sorry! ), simply because it would only assist in a minority of cases (versus tier 8 fighters) and only some fighters, even though the random battle meta means survivability versus AA is more important than being able to hold ones own versus just two of the other tier 8 CVs in terms of dogfighting. Either a flat hp buff or a flat air speed buff would help both fighters and torpedo bombers in all cases, scenarios and matchmaking situations. A tier drop from t7 to t8 would only benefit a single aspect of gameplay versus only 2 of the tier 8 cvs. But this has not happened, stats in the TEST version have been lowered along with the tier, from tier 8 to 7. The bombers on the other hand I do agree with you. Although the 'release' bombers should likely be tier 7. The Test 3 bombers are healthy enough for tier 8. I tried the new test model. I believe if they go 2 fighter dquads, 2 torpedo squads and 1 dive bomber squad with additional fighter reinforcements, it will be good. I can't get my TB's through the total [edited] that is the Star Trek-like shields of AA fire from BB's that have NO business wiping out an entire wing. I've encountered both the original DB and the recent TB version of Graf Zeppelin while playing a BB several times. The DB version I hold in laughable contempt. The TB version you have to respect, and an BB with AA capability mitigates that issue for personal defense. Otherwise, you better hope a Cruiser is nearby to bail you out. I was playing a Kii with an AA Build. If my team had not folded so badly on my part of the map and me taking gunfire from 3 directions, I'd have easily dealt with the Graf's bomber threat. But any BB without AA Build has to SERIOUSLY respect TB-Graf Zeppelin far more than the DB version. People whine and whine about AP Bombs, but plain old torpedoes, especially in the amounts the likes of TB-Graf Zeppelin and Kaga can drop, will end a BB more quickly and reliably. Torpedoes are not RNG Dice Rolls, Dive Bombers are. IMO, if the fighters s--k, that is fine, as long as the CV is compensated with powerful attack capability and the reserves to take losses. In other words, the "Kaga Formula," and she is doing amazingly well with super-[edited] fighters. Her attack power is what carries her to success despite those fighters she has. It is also balanced by the fact that a competent CV with good fighters can reign in that damage output if not careful. This is a tough week for strike CVs, with the missions up promoting heavy AA builds on battleships and cruisers. 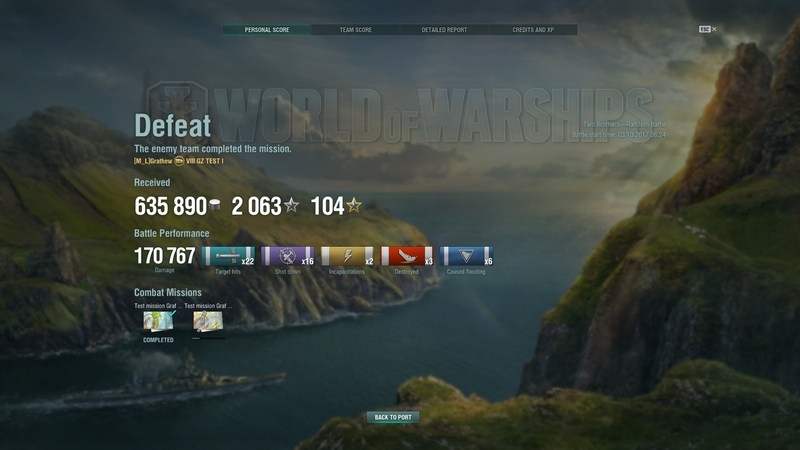 But, it is true, that in a high tier match versus tier 10 cruisers and bbs, the GZ DWT test version is quite useless. Unable to attack destroyers, unable to get enough (if any) torpedo bombers through AA auras to the point where they can drop. But this is true for all torpedo bombers of all 4 tier 8 carriers, isn't it? Torpedoes are not RNG Dice Rolls, Dive Bombers are. This is a superficial assessment. When diver bombers fdrops are determined manually (alt), they are no more or less RNG than torpedo bombers. Both have a chance to crit, both have a (very probable) chance to achieve multiple hits. The only real difference is that a tb approach is broadside on, a (sensible) dive bomber approach is more usually stern/bow on, everything else is purely graphical interface stuff. If you're gonna limit the US CVs to just 1 TB squadron at the cost of 0 Fighters then this is crazy to give it 3TB even if they are Deep Water. Furthermore, AP Bombs of Enterprise and DW Torpedoes of GZ should be optional in-game choices. A Destroyer, Cruiser, or Battleship can change fro HE to AP shell with a reload penalty. Aircraft squadrons which are on board a CV (not in the air) should be able to do the same. I have not found any Dive Bomber from any ship to be of concern than reliable torpedo bombers, even those from Enterprise AP DBs and those from Graf Zeppelin. Dive Bombers are still dice rolls no matter what. Torpedo Bombers are never dice rolls. Then that's it, no dice rolls. With the amount of torps the TB-GZ drops, that is a lot of firepower without having to roll a bunch of dice to get anything done. Edit again: Let me be frank, pre-release, I was the fan of the 15 TB Graf Zeppelin that WG took away before its release. 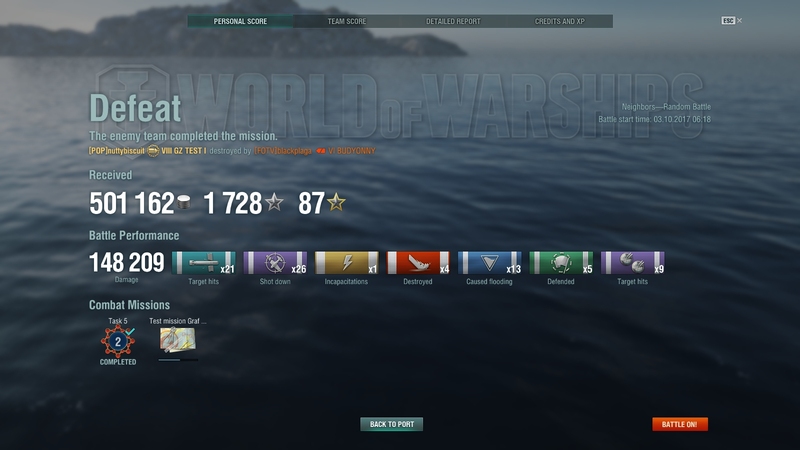 Torp Bombers are the way. It's no coincidence the CVs that have an absurd amount of TB power are among the best CVs in the game. Edit again: It would be interesting to see the stats of the different Graf Zeppelin versions collected by WG. 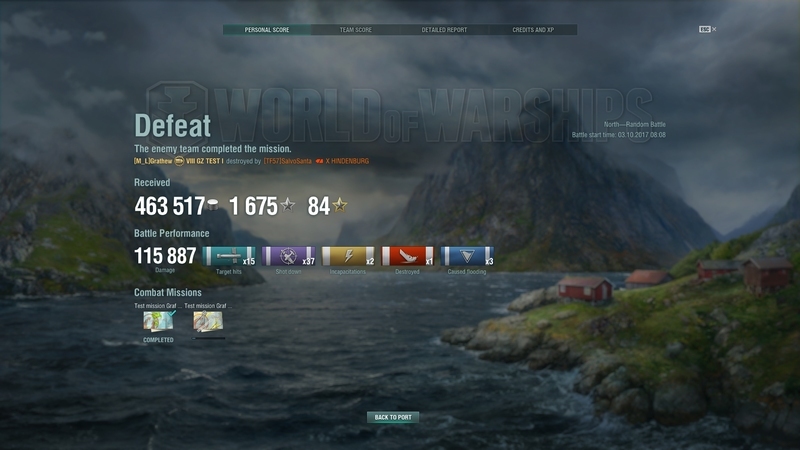 We cannot rely on the typical stat websites that we players use like Warships Today because it's not to that level of precision. I guess we'll see in the end which is worse, the DB or TB variant, by which is the finalized spec that WG adopts. WG dropped the original 15 TB version for a big reason, after all. The dive bombers for the Graf Zeppelin are (both vanilla HE and all 3 AP versions) quite as predictable as the torpedo bombers, while 2 versions of the AP and the HE are unavoidable, guaranteeing multiple hits. The torpedo bombers simply do not offer this, what they offer instead is traceability, as you can see the track of your munitions. It is incorrect to pretend that there is a real difference in terms of "RNG" for one or the other. I do not know how many of the GZ versions (including the vanilla release) you have played a sufficient number of times to make a fair comparison to the dive bombers of other in game nations, but I have doubts reading this. I would rather the GZ have the AP bombers myself, at least I can hypothetically still damage all ships.